BOSTON, MA (BRAIN)—Go211.com, an action sports social networking and online video share site, is partnering with BMX pro rider Tara Llanes in hosting an online auction to help raise funds towards Llanes' growing medical costs. SEYMOUR, CT (BRAIN)—Thule will put the summer sun to good use this year with a 318-kilowatt solar system installed on the roof of the company’s Seymour, Connecticut headquarters. The system will generate 26 percent of the power used at the 108,000-square-foot warehouse. WATERLOO, WI (BRAIN)—Retailers who learned yesterday that Trek planned to sever ties with Greg LeMond expressed sadness but little surprise that the relationship had deteriorated. CANTON, MA (BRAIN)—Kryptonite, a brand in Ingersoll Rand’s Security Technologies Sector, has appointed Karen Rizzo as general manager. GRAND JUNCTION, CO (BRAIN)—Mountain Racing Products, parent company of White Brothers Cycling, has unveiled its new Web site featuring graphic design by Andre Shoumatoff and action photography by Mike Curiak. CHATSWORTH, CA (BRAIN)—Forbes Bagatelle-Black has joined Currie Technologies as vice president of engineering. In this role he will oversee all aspects of the product development group. Pro-Tec's Sean Methven dropped by BRAIN world headquarters on Tuesday to rip up Aliso Wood on his Turner. He also showed off a bunch of cool freeriding and downhill product. Click on link to check it out. WATERLOO, WI (BRAIN)—John Burke, president of Trek Bicycle Corporation, told employees this morning that Trek has asked a federal court to terminate the company’s ongoing relationship with three-time Tour de France winner Greg LeMond. WINTER PARK, CO (BRAIN)—Winter Park Resort has announced the dates and tentative schedule for the 2008 Colorado Freeride Mountain Bike Festival scheduled at Winter Park Resort for July 31 – August 3. TORONTO, Ontario (BRAIN)—Cervélo’s new test ride program, éRide, debuted this past Saturday at the Redlands Classic in California. The program will continue across the United States and Canada, making stops at Cervélo dealers and cycling events until the end of July. Click on link for schedule. "The Amish used candles in their (buggies)." —Justice of the Peace Patrick Marum, ruling that a pedal car with tea lights instead of light bulbs as headlights, can be pedaled on Toronto streets. Confused? Click on link to find out more with video. CALGARY, Alberta (BRAIN)—Chariot has launched a new and improved Web site. The completely redesigned site includes many new features including an easier to navigate layout. VISTA, CA (BRAIN)—Bicycle clothing designer and manufacturer Canari Cyclewear has bolstered its U.S. sales team by adding 10 new reps in the first quarter of 2008. "Those Cannondale guys sure know how to ride a bike, but driving..." —BRAIN's Robert Torrico this past Friday. SEATTLE, WA (BRAIN)—BikersandSellers.com platform provides an online swap meet for consumers to buy, sell or trade, new and used cycling related items to their fellow enthusiasts. Retailers will also be able to target market items to local and a nationwide audience at no cost. 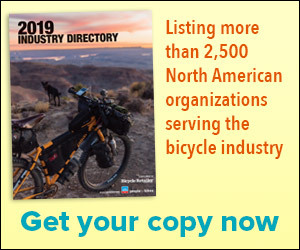 LUMBERTON, N.C. (BRAIN)—Aqu, Inc., organizers of The Tour of America, a multi-stage coast-to-coast professional bicycle road race, have postponed the inaugural race until September 2009. SEATTLE, WA (BRAIN)—Corsair Bikes had added three new international distributors, bringing the total number of countries with Corsair Bikes distribution to 19. CRANSTON, R.I. (BRAIN)—After four years with Uvex Sports and more than 14 years in public relations, Maria Miglioretti has decided to leave the field to pursue other ventures. "Your bail should not be more than three times your bar tab." —Mutt Lynch's (food and drink establishment) billboard near the Newport Beach Pier. —Thank you for all the positive e-mail feedback regarding yesterday's The 5th Spot.